Whenever I see an overpass or billboard that’s been tagged, I worry about the tagger and the danger they exposed themselves to in order to get that cherry spot. 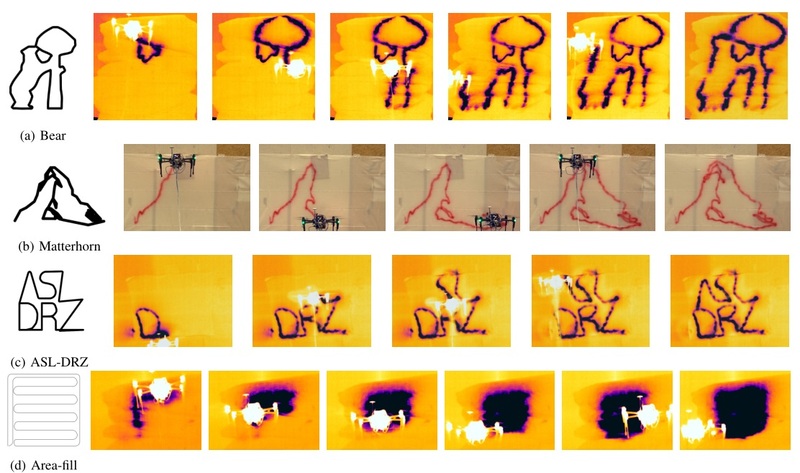 Perhaps this spray paint-toting drone developed by ETH Zurich and Disney Research will take some of the danger out of the hobby. It also could be used for murals and stuff, I guess. Although it seems an obvious application in retrospect, there just isn’t a lot of drone-based painting being done out there. Consider: A company could shorten or skip the whole scaffolding phase of painting a building or advertisement, leaving the bulk of painting to a drone. Why not? There just isn’t a lot of research into it yet, and like so many domain-specific applications, the problem is deceptively complex. This paper only establishes the rudiments of a system, but the potential is clearly there. 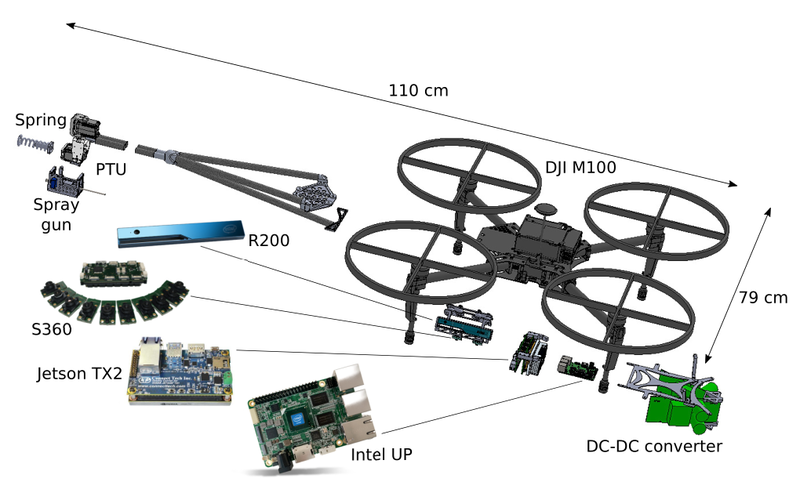 The drone used by the researchers is a DJI Matrice 1002, customized to have a sensing rig mounted on one side and a spraying assembly on the other, counterbalancing each other. The sprayer, notably, is not just a nozzle but a pan-and-tilt mechanism that allows details to be painted that the drone can’t be relied on to make itself. To be clear, we’re still talking broad strokes here, but accurate to an inch rather than three or four. It’s also been modified to use wired power and a constant supply of paint, which simplifies the physics and also reduces limits on the size of the surface to be painted. A drone lugging its own paint can wouldn’t be able to fly far, and its thrust would have to be constantly adjusted to account for the lost weight of sprayed paint. See? Complex. The first step is to 3D scan the surface to be painted; this can be done manually or via drone. The mesh is then compared to the design to be painted and a system creates a proposed path for the drone. Lastly the drone is set free to do its thing. It doesn’t go super fast in this prototype form, nor should it, since even the best drones can’t stop on a dime, and tend to swing about when they reduce speed or change direction. Slow and steady is the word, following a general path to put the nozzle in range of where it needs to shoot. All the while it is checking its location against the known 3D map of the surface so it doesn’t get off track. In case you’re struggling to see the “bear,” it’s standing up with its paws on a tree. That took me a long time to see, so I thought I’d spare you the trouble. Let’s be honest: This thing isn’t going to do anything much more complicated than some line work or a fill. But for a lot of jobs that’s exactly what’s needed — and it’s often the type of work that’s the least suited to skilled humans, who would rather be doing stuff only they can do. A drone could fill in all the easy parts on a building and then the workers can do the painstaking work around the windows or add embellishments and details. For now this is strictly foundational work — no one is going to hire this drone to draw a Matterhorn on their house — but there’s a lot of potential here if the engineering and control methods can be set down with confidence.